Step 1. 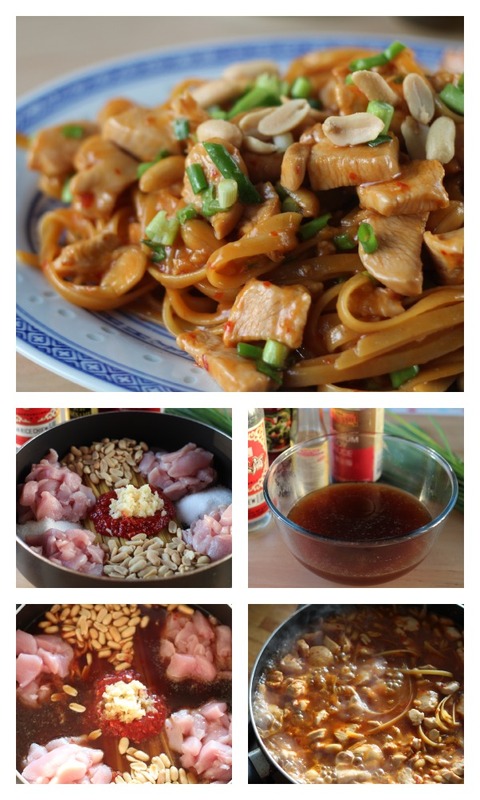 Place pasta, chicken breast, sugar, peanuts, chilli garlic sauce and garlic in a frying pan. In a bowl, mix together stock, soy sauce, wine, vinegar and oil. Step 2. Pour stock mix into the pan and bring to the boil over high heat. Step 3. Reduce heat to simmer and stir constantly until there is just enough sauce to coat the pasta and it is cooked al dente. Add more water if required. Step 4. Remove from heat and stir through shallots. Garnish each serving with a sprinke of peanuts and serve. My chef father would be mortified to see this dish. In Chinese cuisine you don’t add pasta to a dish and you definitely don’t use the one-pot method. But I am a time poor mum and a tasty, fast meal will win every time! The chilli garlic sauce I used in this recipe is Lee Kum Kee brand and the shao tsing wine can be found in the Asian grocery section of most stores.